This beautiful 4800 sq ft, 6 bedroom/2.5bathroom North Phoenix retreat boasts many custom features such as a state of the art diving pool ( not heated ), outdoor barbecue with built in stone beehive fireplace and bench seating (great for entertaining), RV parking, gourmet kitchen complete with top of the line stainless Viking appliances, front loading LG washer/dryer. 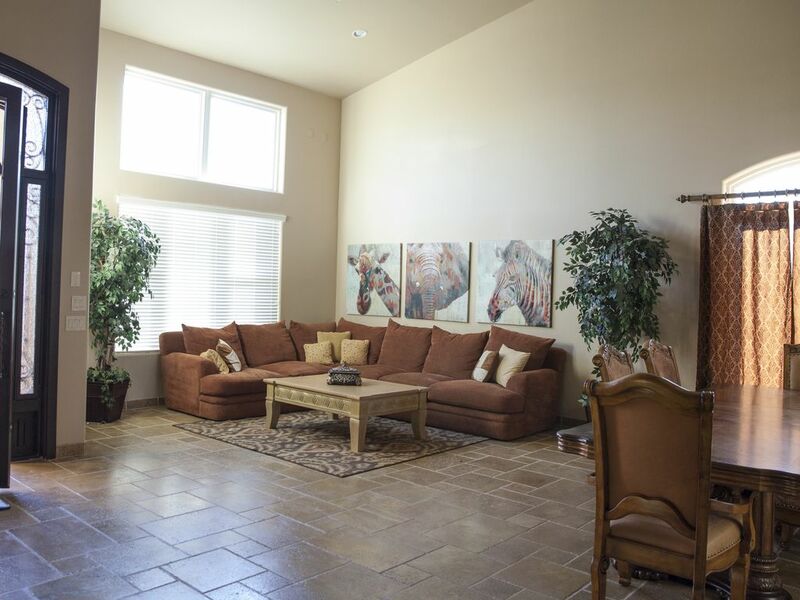 Location is everything and you will find that while this spacious property is in the heart of it all it is also tucked away in a beautiful serene neighborhood of custom homes surrounded by gorgeous mountains, hiking trails, lighted tennis courts and just a 20 min drive to Lake Pleasant. There is a casita with two queen beds available for weekend rentals on the property, Ideal accommodations for spring training fans and baseball players! Other nearby attractions include: The 500 Club 18 Hole Championship Golf Course; Cardinals Stadium; Peoria Sports Complex; Gila Convention Center; Arrowhead Lakes; Wet 'n Wild Waterpark: Waste Management Open; Barret Jackson. Place was great it was so spacious and we would defintly come back to stay. Good spot for a large group. This is a great house for a family vacation. Randy our Host was very attentive to any of our need. There is definitely a pride of ownership. Will be back next Spring. It was one of the best VRBO stays we have had anywhere in the country. The home was exactly what our family wanted for our stay during our daughtet’s wedding. It was spacious, very well appointed, clean, and pleasant. Given the opportunity, we will definitely want to stay there again. The yard was excellent for our children and safe. We had 23 people staying there and we had all the necessary, quality cooking and eating necessities. Beds were comfortable and the towels of good quality. We had a very good time. Our group loved the house and multiple people told me it was even better than the pictures! We had more than enough space for the 20 of us who slept there. We loved the common areas, it was easy to gather and kept super clean with great attention to details. Randy was extremely attentive as a host and easy to get a hold of during the booking process and also during our stay. We would definitely stay here again! Thanks so much, it was a pleasure to have your group. Look forward to seeing your group in the future.